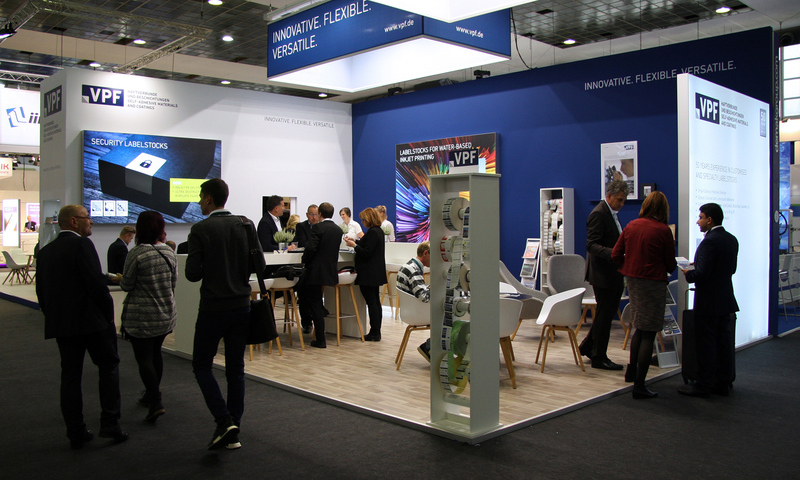 In its 50th anniversary year, VPF GmbH & Co. KG, the Germany-based specialist in self-adhesive materials and coatings, will be exhibiting at LabelExpo 2017 in Brussels (Hall 4, Stand C67) with the innovativeness and versatility it is known for in the market. The main focus will be on a considerably expanded range of seawater resistant self-adhesive materials as well as new developments for special security applications and water-based inkjet printing. VPF has developed a completely new extensive portfolio of combinable options for sea-water-resistant self-adhesive labelstocks that can be printed with variable information by laser, inkjet or thermal transfer printers. For water-based inkjet printing, a new item being presented is the Inkjet Special PP white matte 85 μ film (VPF 60241), which has been tested – also in compliance with BS 5609 Section 2 – and approved for use with pigmented inks on all common printing systems (EPSON C 3500, Primera LX 2000, Kiaro D). For colour laser printing, VPF presents the Laser PP film 100 μ in matte white with opaque back side (VPF 60606), and for conventional printing its long proven Data Special PE film in matte white with a thickness of 95 μ. All three films are available with BS 5609-tested adhesives in hot melt, dispersion and UV acrylate varieties. Depending on the application area and the technology chosen, they can also be supplied with increased coating weights up to 40 g/m2. The demands on protection and security for premium products are steadily growing. Meeting these expectations, VPF will be showcasing a broad range of 11 security films at LabelExpo. These security materials are designed with a variety of protection mechanisms, such as VOID, checkerboard or diamond patterns and splittable or ultra-destructible characteristics. They come in white, silver, holographic or clear – matte or glossy, as desired. A brand new member of the range is a transparent, ultra-destructible acrylate security film with a thickness of 50 μ (VPF 72704) which can be used as an authenticity seal for branded products or as a tamper-evident closure for pharmaceutical packaging. Another innovation being presented to the industry for the first time is the Inkjet-PE splittable 120 μ film in matte white (VPF 71634) that enables security labels to be produced very economically on demand and in colour, even in the smallest print runs, using water-based inkjet printers. As with all other VPF security materials, these two films are already available from a minimum order quantity of 200 m2. Among the digital printing processes, water-based inkjet printing has firmly established itself in recent years as a niche solution for high-quality small print runs as well as for flexible inhouse label printing. In this segment, VPF displays its technology and innovation leadership in inkjet self-adhesive materials by presenting four new facestocks offering entirely new application possibilities. The very thin Inkjet Paper in matte white (VPF 1393299) with a grammage of 70 g/m2 is especially suitable for adhesion to small radiuses and for removable labels. Another new addition to this range is the Inkjet PET 80 μ film in glossy white (VPF 70363). Because of its high temperature resistance, it is ideal for many technical applications. Moreover, it is not only suitable for water-based inkjet printing but can be used in laser printers as well. VPF has also augmented its extensive portfolio by an 110 μ glossy silver Inkjet Special PP film (VPF 60449). Another new addition is the Inkjet PO film 80 μ in glossy white. It has higher elasticity than comparable Inkjet PP films and is especially suited for use on deformable containers and for attaching labels around small radiuses. The VPF portfolio for water-based inkjet printing now includes 15 specially developed films and papers which can be freely combined with the required special adhesives and release liners from the VPF range to meet the requirements of the specific application. 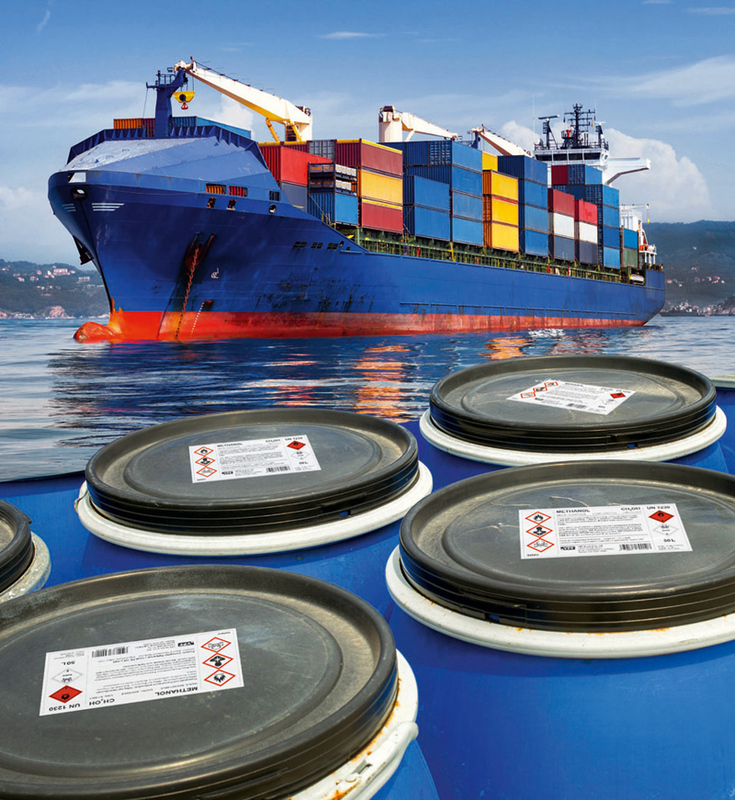 In international trade there is a growing demand for seawater resistant labelstocks and adhesives that comply with the stringent requirements of the BS 5609 standard. In response to this, VPF has developed a completely new portfolio that includes for the first time a colour laser printable PP film and a seawater resistant Inkjet-Special PP film. 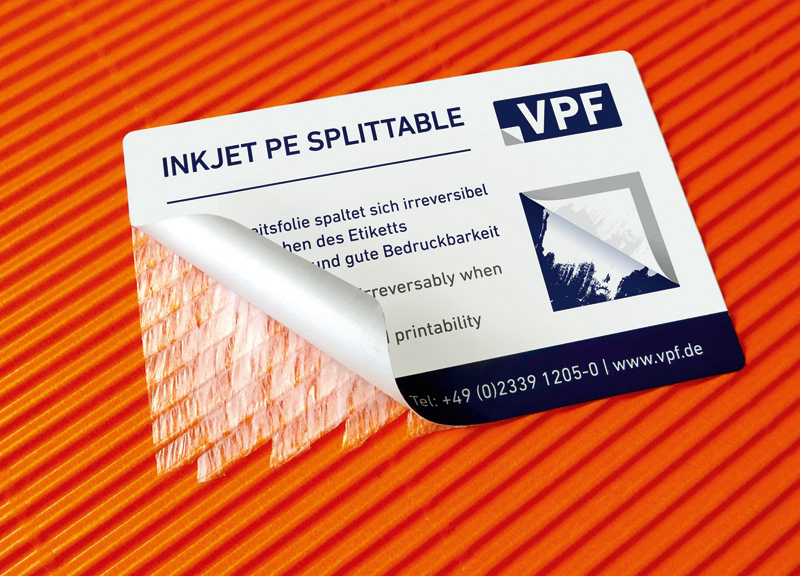 Innovative Inkjet PE splittable film – any attempt to tamper with the labels causes them to develop the proven splittable peel effect which instantly reveals that someone has tried to open a package.